The Movado BOLD women’s watch is inspired by refined architectural purity that lets you discover a stunningly beautiful vision of our sunray dial. It features a thin 44 mm yellow gold ion-plated stainless steel case and a K1 crystal with a ring of gold-toned metallization with a gold-toned hour index. The gold-toned sunray dial has a matching sunray dot and hands and the yellow gold ion-plated stainless steel mesh-link bracelet utilizes a deployment clasp that makes putting on and taking off your watch as easy as pushing a button. Removable mesh-textured links at the back of the bracelet allow the size to be adjusted to achieve the perfect fit. 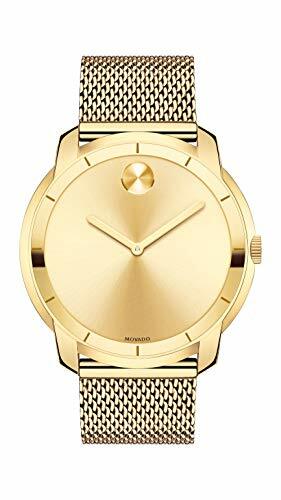 This iconic wristwatch for women includes all the quality components you expect from Movado. The K1 mineral crystal is more shatter-resistant than sapphire crystal and more scratch-resistant than regular mineral crystal. The Swiss quartz movement ensures the watch is accurate, reliable and requires minimal manual maintenance. The BOLD watch has a water resistance rating of 3 ATM. This long, rich heritage of artistry and innovation in design and a close, enduring association with the arts continue to define the Movado brand identity. Always in motion, Movado creates modern watches of exceptional craftsmanship and design distinction. ELEGANT, MODERN DESIGN: The Movado BOLD women’s watch is inspired by refined architectural purity that lets you discover a stunningly beautiful vision of our sunray dial. QUALITY MATERIALS, ICONIC STYLE: Features a 44 mm yellow gold ion-plated stainless steel case and mesh-link bracelet and a gold-toned metallic Museum dial with matching sunray dot and hands. It is water resistant up to 3 ATM.